Travelling is incomplete without food. Fortunately, Baguio offers a lot of delectable dishes which make its visitors fully experience its vibrant culture. I enliven my morning with the hotel’s all-you-can-eat buffet breakfast. Variety of local foods were served and I ate as much as I could so that I can surely survive various activities throughout the day. 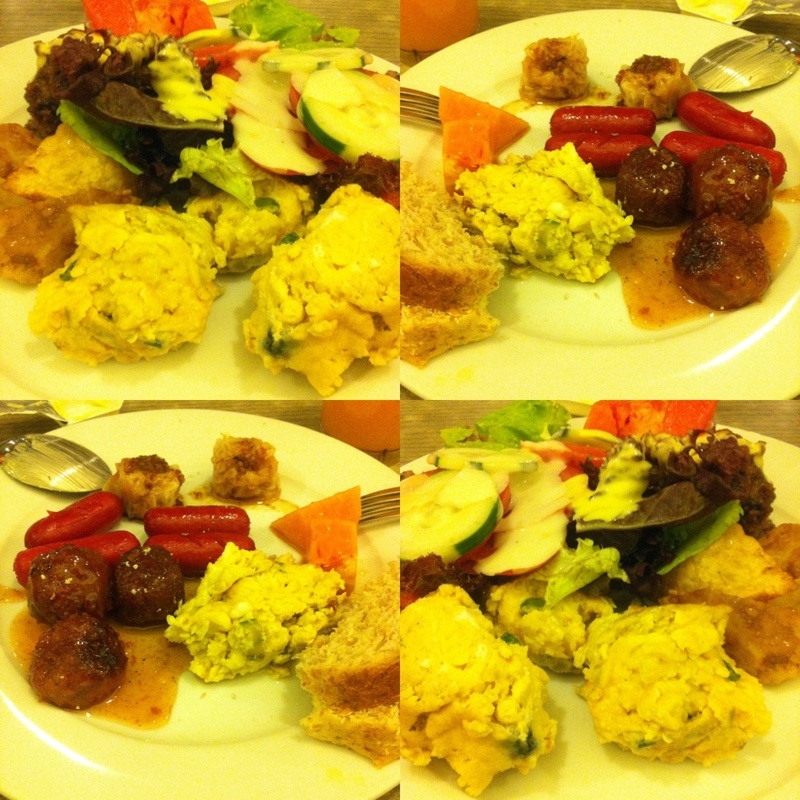 Scrambled eggs, spicy meatballs, chicken adobo, luncheon meat, pork siomai, lettuce, banana, melon, pancakes and breads were some of the foods I ate. We were hungry by the time we reached the hotel so we immediately searched for a pleasant place to eat. 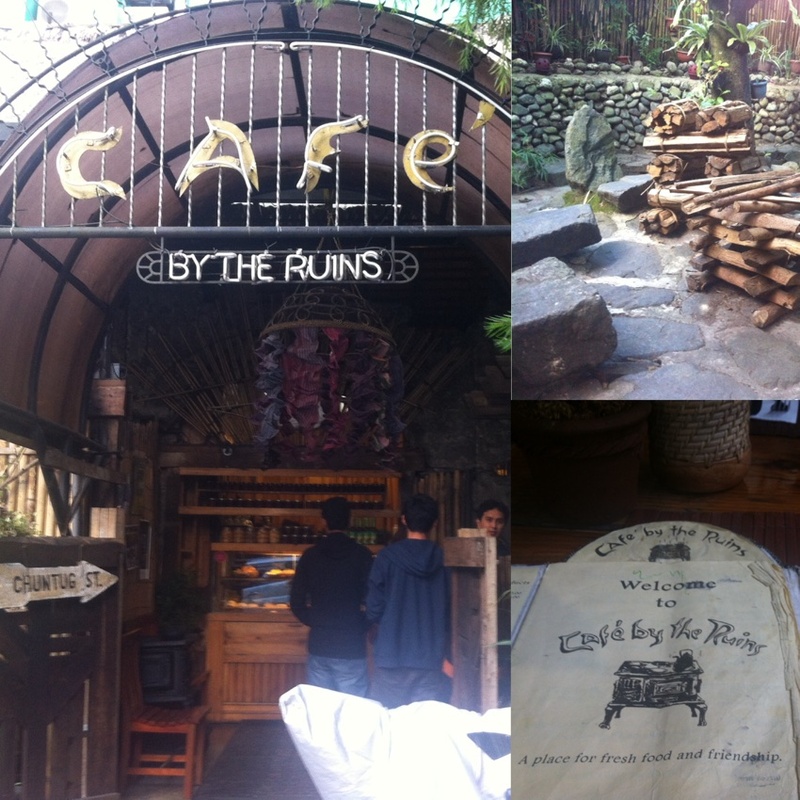 Café by the Ruins was suggested and after a distant walk, we finally got there and had a chance to order the food they serve. I ordered Ruin’s Fillet Mignon: thick tender beef wrapped in café bacon and served with herbed buter and green beens. While waiting, I observed restaurant’s design. Its interior was noticeably nature-friendly: combination of wooden structures and furnitures, stones, trees, plants. I have read somewhere that the restaurant even preserved its colonial architecture and the damages resulting from World Ward II with only few alterations. That’s why it was called Café by the Ruins. Going back to my hungry stomach, although the Fillet Mignon looks good and was served nicely, I was disappointed because there was nothing special with its taste. Moreover, the meat was so hard to slice and chew. 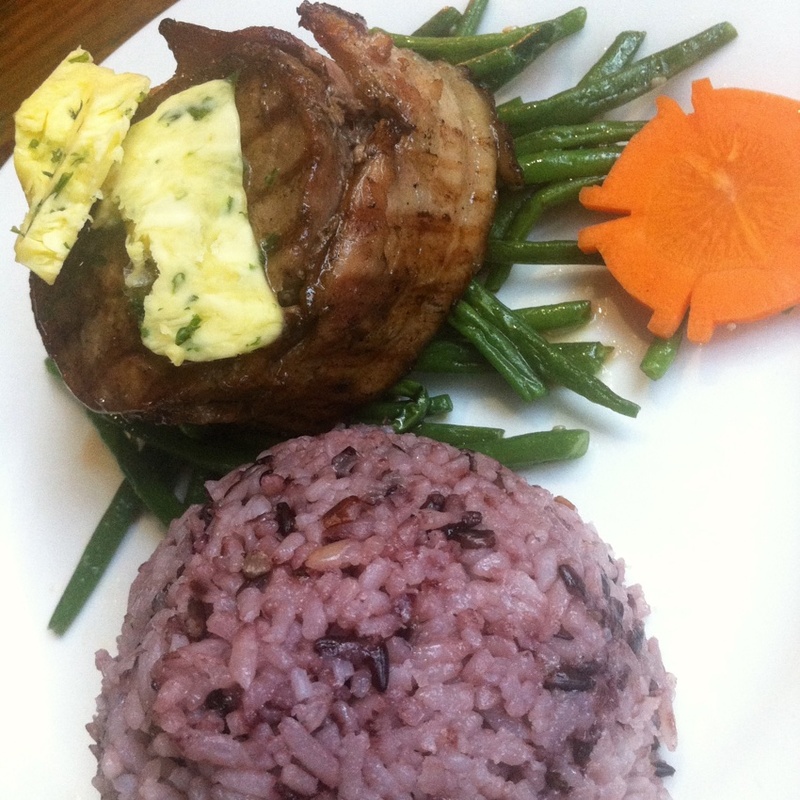 The butter on top of the beef was bland together with the purple rice. On the good side, I had tried a new restaurant and my stomach did not growl anymore. Would probably be back here again someday and try my luck with the other dishes. It was Friday night when we were walking along the Session Road looking for a nice place to eat when we came across Solibao Restaurant. It is a local restaurant dubbed as Baguio’s best Filipino restaurant since 1972. We ordered two sets of fine meals. Combo A: Ihaw-ihaw sa Bilao grilled pork belly, fried octopus, fish fillet, salted duck egg, eggplant, tomato, green mango, bagoong), Canton Sotanghon Guisado and Adobong Kangkong. Combo B: Sinigang na Boneless Bangus sa Miso, Grilled Pork, Crispy Fried Chicken. The cold breeze of the air outside didn’t flow freely inside the restaurant so it was quite hot. But it didn’t stop me from eating small portions of each serving. Truth be told, I didn’t care that much about the taste of the foods. I just enjoyed eating as much as I could. We were supposed to go to the Chinese Temple and the Bell Church but unfortunately it was closed. So we decided to head somewhere near to eat lunch. Baguio Central Park Restaurant was the primary choice. It is a Chinese restaurant situated along Kisad Road, Carino Street. At first glance, I noticed its wide space, cozy and well-ventilated area. A lot of food were served and as usual, I took portions of each meal and then grabbed some more of which really tastes delicious. Everything was scrumptious. I was already full but I still wanted to eat more. I didn’t have the chance to take lots of photos or ask the names of the foods as I was busy chewing. Highly recommended! 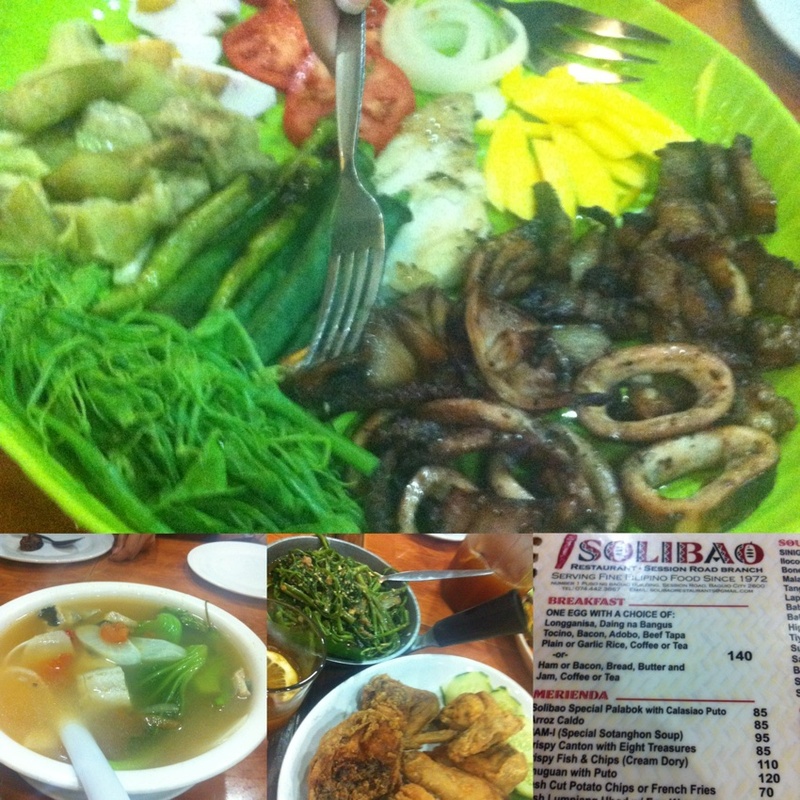 Overall, I had a happy stomach while I was in Baguio! 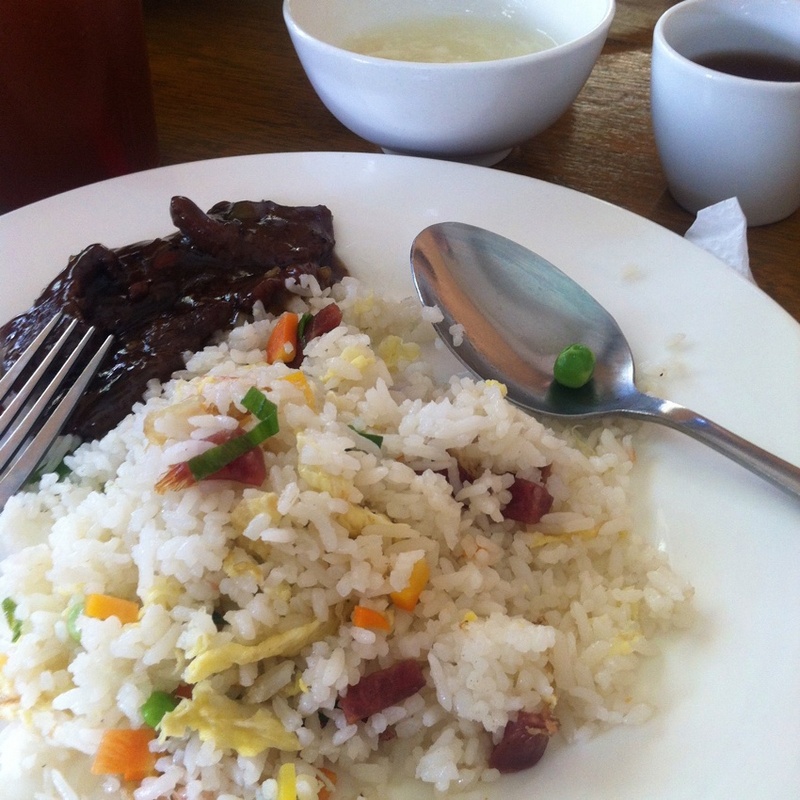 This entry was posted in Food Corner, Space Travel and tagged baguio, food, restaurant. Bookmark the permalink.